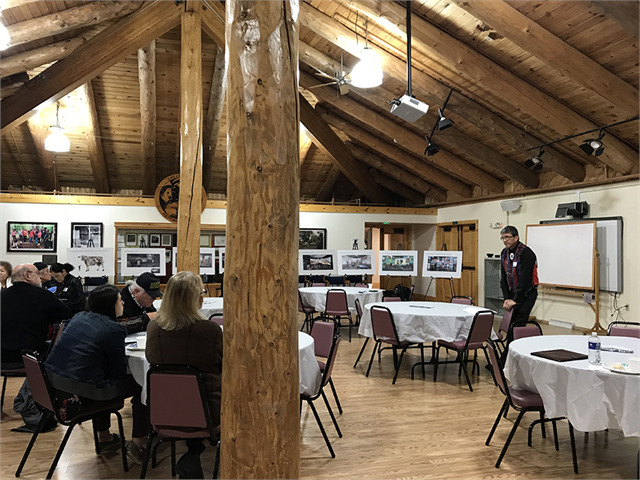 KESHENA — Staff members from the Wisconsin Historical Society met with the Menominee Nation on Oct. 30, 2018 for the second of 14 new museum engagement sessions planned for the American Indian nations of Wisconsin. The event was held in the Culture Center at the College of Menominee Nation — one of two accredited tribal colleges in the state. Society staff greeted community members as they arrived and chatted over a meal before the formal start of the program. Society staff members in attendance included Christian Øverland, the Ruth and Hartley Barker Director, Jennifer Kolb, Division of Museums and Historic Sites Administrator, Rebecca Comfort, American Indian Nation Liaison, and Janet Seymour, Field Services Representative. David Grignon, a member of the Menominee Nation who also serves as the Tribal Historic Preservation Officer — a role which he has held for 27 years — helped coordinate the event. 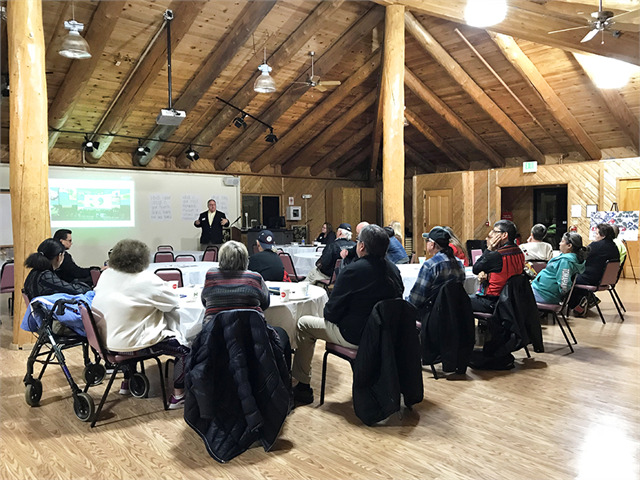 As the last guests arrived and finished their dinner in preparation for the event, Grignon addressed community members and Society staff in attendance and provided a blessing in Menominee. Following the blessing, Douglas Cox, Chairman of the Menominee Nation, and Grignon offered opening remarks. Addressing community members and Society staff in attendance, Cox focused on the Menominee Nation’s relationship with the Society in the past, present, and future. “[The Society’s] efforts to reach out to tribal communities about the new museum is meaningful to us,” Cox said. Emphasizing the importance and opportunity for tribal participation in the new museum project, Cox underscored the Society’s role and responsibility as a steward of Menominee history and culture. 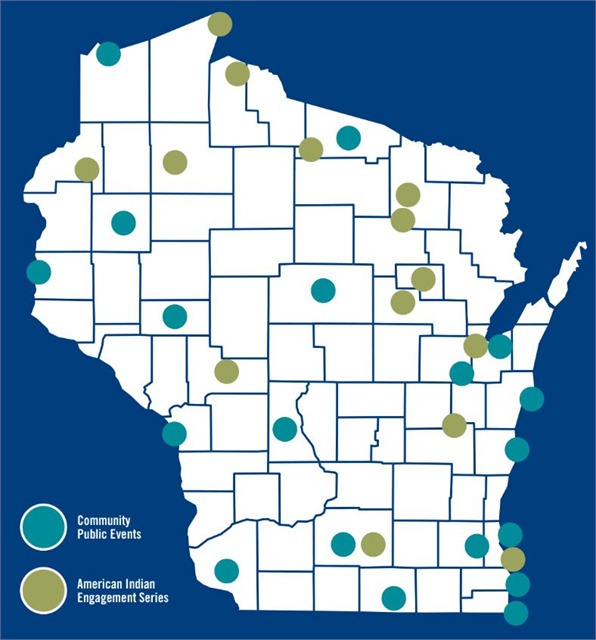 “We are alive and well,” the chairman said, “and we continue residing here — on our ancestral land in the Menominee Nation.” Concluding his remarks, Cox stated that the Menominee are ready for the opportunity to share their ideas and voices and participate in partnerships with the Society that address issues that are critical to the Menominee Nation. Reflecting on the importance of place and increased access to resources, guests shared enthusiasm about several of the renderings that depicted programming spaces with the potential to broadcast live between the museum and students in the Menominee Indian School District. Community members also engaged in dialogue with Øverland about the challenges museums face related to telling difficult histories truthfully and sharing culture responsibly. Øverland emphasized the importance of honesty in decision making when creating exhibits. 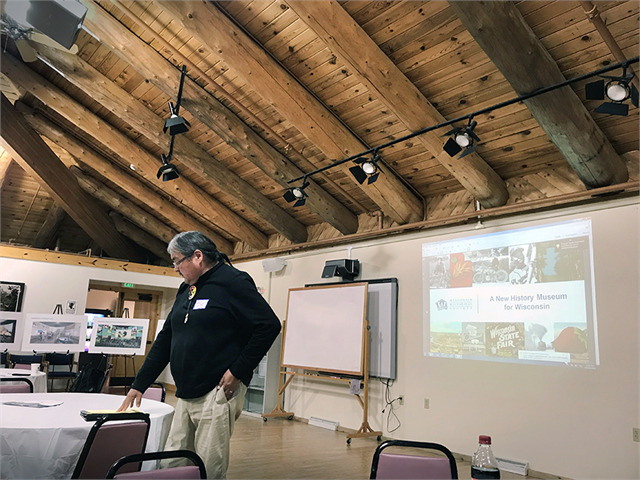 Douglas Cox, Chairman of the Menominee Nation, discusses his tribe's relationship with the Wisconsin Historical Society in the past, present, and future. “[The Society’s] efforts to reach out to tribal communities about the new museum is meaningful to us,” he said. David Grignon, a Menominee Nation member who has served as the Tribal Historic Preservation Officer for 27 years, helped coordinate the "Share Your Voice" event, offered an opening blessing in Menominee, and made welcoming remarks to begin the session. 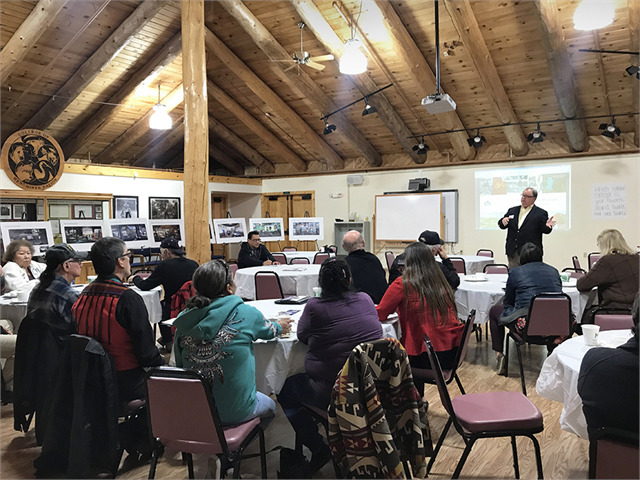 Christian Øverland, the Ruth and Hartley Barker Director of the Wisconsin Historical Society, discusses a new museum exhibit design concept rendering with members of the tribal community at the College of Menominee Nation in Keshena on Oct. 30, 2018. “If we’re going to do this right, people will see themselves in this museum,” Øverland said.